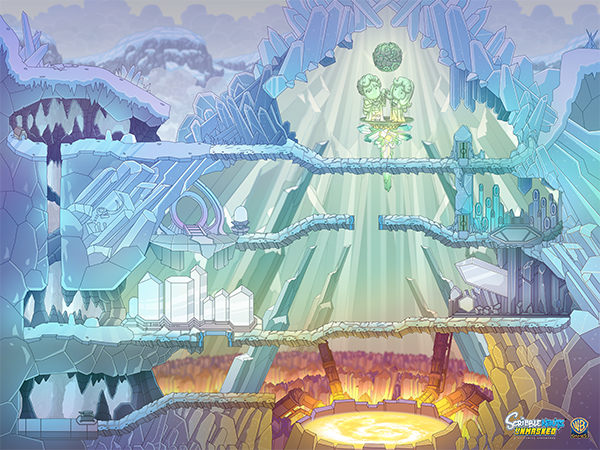 I had the opportunity to design one of the most iconic locations in all of DC lore... the Fortress of Solitude. It was designed as a large map and needed to be as Superman's Fortress has a LOT of areas that make it iconic. The Sunstone Simulator, The Phantom Zone, Bottled City of Kandor, Atomic Cauldron, Cosmic Anvil and the memorial statue of House El - they all made it in. The Interplanetary Habitat and Museum were scheduled to make an appearance and are drawn in - however the cages were never filled due to time constraints. This simulator is the virtual embodiment of all Kryptonian knowledge and culture. By sliding specific crystals into their corresponding receptacles, Superman can activate a holographic simulation of his father, Jor-El. The Portal and Projector to the Phantom Zone - the famous prison with such inmates as General Zod. Kandor is a miniaturized city populated with people from various alien cultures. It is named after the original Kandor City, a lunar colony from Superman's home planet, Krypton. The Fortress houses a large statue of the deceased parents of Superman - a memorial to them and the lost world of Krypton. Located deep in the Earth, the Atomic Cauldron is the most powerful furnace in the world.